The magnitude of Greece’s fiscal challenge was painted in sharp relief yesterday as Athens unveiled new budget projections exceeding the worst-case scenarios envisioned by international lenders when they agreed an €174bn rescue eight months ago. Instead of Greece’s debt peaking at 167 per cent of economic output next year, as predicted in the March bailout agreement, it will hit 189 per cent and climb to 192 per cent in 2014, according to projections presented to the Greek parliament. Even under an “alternate scenario” prepared by the International Monetary Fund in March, which attempted to project a pessimistic economic and fiscal picture, Greece’s debt was only predicted to peak at 171 per cent of gross domestic product. The new projections all but dash hopes Greek debt would come down to 120 per cent of GDP by 2020 – once held out as the standard for a manageable debt load – and senior EU officials acknowledged they may have to give Athens more leeway to hit that target under a revised rescue currently being negotiated. James Montier’s answer to a follow-up question at the European Investing Summit 2012 (for those interested, the next Investing Summit is on Japan and will take place November 7-8....more information can be found HERE). Question: Going back to the lowest point of the markets in late 2008/2009, what was going through your mind? How did you retain the courage and confidence to carry on? James Montier: In late 2008 and early 2009 I was getting very excited because I was seeing a large number of stocks appearing on my value screens, and seeing cheap valuation at the market level. So whilst a lot of people were focusing on the things that could go wrong (and there was no shortage of them back then), because I was focused on valuations I was getting buy signals. The key point is to have a good process and to stick to it. This cuts down on the amount of decision making under duress that you are forced to conduct. Sir John Templeton used to talk about doing his analysis on quiet days in the market and placing limit orders with brokers, he knew when the stock was down 50% he wouldn’t want to buy it (emotionally) but his pre-commitment strategy forced him to do so. So maybe central bank intervention delayed the “next few months” part, but it appears their thesis (of which there is more detail HERE) remains intact. Japan’s worsening trade gap will make it harder to service the world’s largest debt, fulfilling part of the doomsday scenario that Hayman Capital Management LP is betting on. The nation’s 10-year note yield may rise toward 10 percent from the world’s third-lowest of 0.79 percent, while the yen weakens, said Richard Howard, who oversees Dallas, Texas-based Hayman’s Japan-focused fund with J. Kyle Bass. That would represent the developed world’s second-highest borrowing costs after Greece, and a surge to that level by the end of 2013 would cause losses of 42 percent for investors purchasing the securities now, data compiled by Bloomberg show. Data yesterday showed Japan had its biggest half-year trade deficit on record. Hayman, which manages about $1 billion, made $500 million by predicting the U.S. housing market collapse, and Bass has said since at least 2010 that Japan’s $12 trillion bond market is heading for a crash. So far, the debt has returned 3.1 percent in the past two years, Bank of America Merrill Lynch data show, while yields touched nine-year lows. Ted Weschler’s first job after college was at chemical maker W.R. Grace & Co. (GRA) In 2007, six years after the company filed for bankruptcy, his hedge fund held 15 percent of the shares. That’s when he called Joe Rice. Rice, a South Carolina lawyer, represented workers who claimed asbestos products manufactured by Grace had caused cancer and other illnesses. The 158-year-old company, which once owned shipping lines and restaurants, declared bankruptcy in 2001 under the weight of those lawsuits. Rice was at an impasse with the firm when Weschler suggested they meet. That ability to find value in distressed companies and cut deals helped Weschler, 51, carve out a role at Omaha, Nebraska- based Berkshire that goes beyond the stock-picking job he was hired for. Since joining Buffett’s firm in January, he has made a bid for a bankrupt mortgage business, negotiated a transaction that pushed Berkshire deeper into newspaper publishing and consulted with the heads of the company’s operating units. In the middle of last month in response to desultory growth, Federal Reserve Chairman Benjamin Bernanke announced Quantitative Easing III, a program most notable for its claims to “unlimited” size. By the calculation of Martin Feldstein in the Financial Times last week, “unlimited” might come to $1.5 trillion of new money created in three years. To put such a sum in perspective, the Fed’s assets totaled all of $825 billion at the beginning of the financial crisis in late 2007. America’s leading economic light, Professor Paul Krugman of Princeton, says that not only is there nothing alarming about this, but that those of us who express concern are like bullies who would scare small children around a campfire for our own amusement. Inflation is dead, now and forever, says the twice a week New York Times Columnist. His assertion will look odd to you if you have been in a grocery store lately, but it grows positively loopy if you’re currently paying for a Princeton undergraduate. Nothing on that campus is going up at a 2% annual rate, least of all tuition. Which might remind all of us how often in politics things look different if you are signing the front of the check or the back. What got us to shake our heads even harder at QE3 was the simultaneous announcement that 0% interest rates at the short term would be extended through mid-2015. Beyond bridling at the clairvoyance that this would require from an institution that was wholly impercipient through the worst of the crisis, it also goes a year and a half beyond the term of Chairman Bernanke, set to expire January 31, 2014. Bernanke was confirmed by the Senate last time by the smallest majority ever, and aren’t the country’s savers, who will have gone without interest for about 7 ½ years by the end of this program, ever to be heard from, ever to have their rights restored? 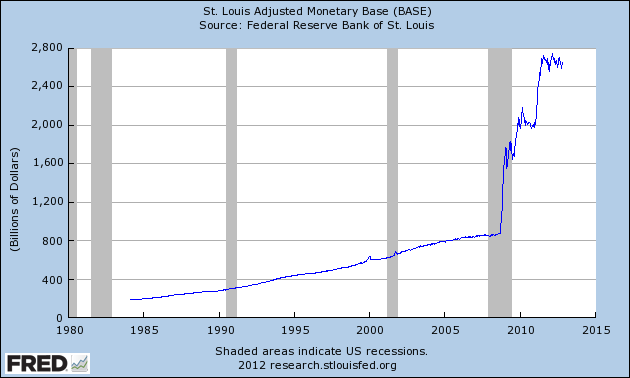 In thinking about what comes after QE3, consider this. It currently costs America comparatively little to service our debt , a little over $200 billion a year, because interest rates are so low. But that number will leap by something on the order of $500 billion the next time interest rates revert to anything like historical low norms. 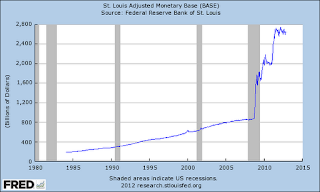 And it will be worsened still more by the losses that the Fed will have on its mortgage and long bond holdings. The Fed and the Treasury came to an agreement that those losses would not be borne by the Fed, but would instead flow through Treasury’s current year deficit. This was reported in January 2011 by Grant’s Interest Rate Observer, and to our knowledge no place else. It is a disturbing agreement, partly because it has the whiff of someone preparing to leave the scene of an accident. But even more, it means the next Fed Chairman, if he only normalizes monetary policy, will be handing the political system an incredible bill, wholly unexpected, about the size of the Simpson-Bowles fix all by itself. And we did not have the courage to implement that fix a year ago. Paul Volker is 6`7”; the next fellow is going to have to be a lot bigger when inflation has to be tamed again. The panic of 2008 is still among us, judging from investor behavior. Most investors are putting a premium on safety at almost any price. This article looks at the lasting impact of the credit crisis: Does it mean we are in a different investment era? Are defensive portfolios that seek extra yield the only prudent strategy in this difficult time? Market volatility and the fallout of the credit crisis have had a profound negative impact on expectations and investment strategy. Nevertheless, we’ll argue that while we are in a new economic era, we are not in a new era for investing, as investor behavior since 2008 reveals. Excessive emphasis on defense exposes long-term portfolios to two key risks: 1) not growing enough to meet longer term objectives and 2) actually losing value (the opposite of the intended goal) if inflation materializes. Recognizing investment extremes, which requires running against the grain, is key to success. We continue to see long term risk to bonds, so we keep maturities short; we find larger high-dividend stocks and US REITs to be expensive; and we see better opportunity in US value stocks, international stocks, and select higher-yielding investments. While no one can predict the future, we build broad portfolios that align investment tools with probable outcomes to help you achieve your long term goals. In this commentary, we review our method for doing so.